What’s grabbed my interest today? Cubbie Station & Water Allocation Abuse! 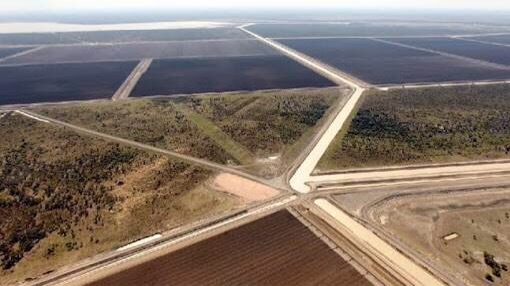 Cubbie Station in Queensland, the overallocation of precious water from our river systems, and the government neglect…both State & Federal…of this issue, would appear to have been flying under the radar for the last couple of years! I have a huge amount of family history in Broken Hill, and the Bourke region on the Darling River. For many years now, Cubbie Station has been controversially taking advantage of a massive water allocation, which has severe effects on the waterways, and creating water shortages in river systems as far down as the Murray River! What is really annoying is that under the original owners, Cubbie Station Group, the property used to be a cattle station, then in 1983 and under Japanese ownership, it was turned over to cotton…one of the most water intensive crops there is…and really not suitable as a crop in this country! So, what is Cubbie Station…and well you may ask! 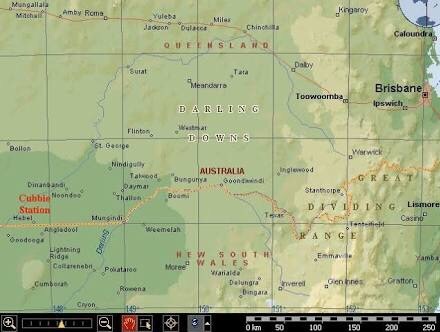 According to Wikioedia, it’s located on the Darling Riverine Plains bioregion, near Dirranbandi in Queensland. It is the LARGEST irrigation property in the SOUTHERN HEMISPHERE! The property covers 96,000 hectares (240,000acres) and is managed by the Lempriere Group, on behalf of CS Agriculture, a joint venture betweenn Lempriere & Shandong RuYi Group, a textile manufacturer owned by investors from China & Japan. 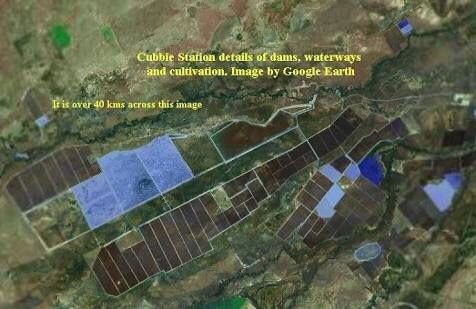 Cubbie Station in South Queensland, Australia’s major interstate water diversion issue. The station has significant water rights to flows along the Culgoa River, within the Murray-Darling basin. The topography of the area is defined by channels & floodplains of the upper reaches of the Darling & Barwon Rivers. Cotton was originally grown in the area from the late 1970s. In 1983, Cubbie Station was converted from grazing practices to cotton growing. The property consists of both agricultural & non-agricultural uses, with approx 22,000 hectares (54,000 acres) presently developed, with a further 11,000 hectares (27,000 acres) under development. The station was created by amalgamating twelve floodplain properties to give Cubbie a total of fifty-one licences. The station’s water storage dams stretch for more than 28 kilometres (17 mi) along the Culgoa River, within the Murray-Darling basin. In an average year the station uses 200,000 megalitres (7,100×106 cu ft) of water, in a good year as much as 500,000 megalitres (18,000×106 cu ft). The water is used to supply 130 square kilometres (50 sq mi) of irrigated cotton and other crops including wheat, which generates a net profit in the range of A$50 million to A$80 million a year. The station is licensed to take 460,000 megalitres (16,000×106 cu ft), the equivalent of all irrigation entitlements downstream in north-western NSW. 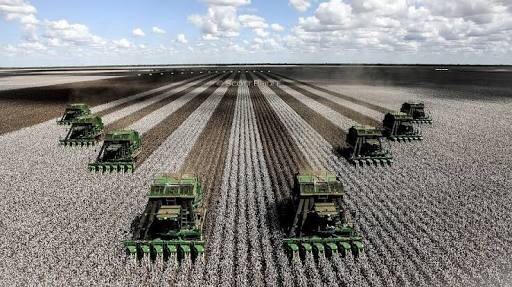 The property has the capacity to grow 200 square kilometres (77 sq mi) of cotton. In 2006, the dams on the property were filled to 1% capacity allowing for only 200 hectares (490 acres) of cotton planting. The station is often derided for its large water usage requirements in a time of extreme drought in Australia and damage to the Murray Darling river system. Scott Bridle: Picking Cotton at Cubbie Station. During his term as Minister for the Environment, Malcolm Turnbull did not rule out its possible acquisition by the Australian government, however he is now Prime Minister*, and the acquisition of Cubbie Station has never occured. On 29 October 2009, Cubbie Group Limited, the former owner of Cubbie Station, announced it would voluntarily enter administration on the following day. The company had incurred debts of over A$300 million, as a result of poor rainfall in the region in the preceding five years. Corporate recovery specialists, McGrathNicol, were appointed as Administrators of the Cubbie Group on 30 October 2009. On 31 August 2012 the Australian Government, on advice from the Foreign Investment Review Board, approved the sale of Cubbie Group, to a consortium comprising Shandong RuYi Scientific & Technological Group Co Ltd, a clothing and textile company owned by Chinese and Japanese investors, and Lempriere Group, an Australian family-owned company involved in wool trading and agricultural property management. The approval provided RuYi with an 80% initial ownership interest on condition that this interest be reduced to 51% within three years. The interest is to be sold to an independent third party. The consortium are bound by existing water licence conditions and the property is operated and managed by the Australian company using the existing workforce. At the time, the Liberal Party were in opposition, and supported the purchase. “an incestuous saga of arrogance & influence”! However, there was dissension amongst some members of the Nationals, who had concerns with foreign-ownership of agricultural land and water rights, claiming that the sale is not in Australia’s national interest. The purchase of Cubbie Group by the joint venture CS Agriculture was completed on 25 January 2013, for an estimated purchase price of A$240 million. So, we now have an Austealian agricultural enterprise, with huge water allocation rights, owned by foreign companies…and let’s be realistic – are they really concerned about destroying viable and much needed river biosystems…compared to making profits! In his “Crikey” article “How Cubbie (and Labor) Consumed the Murray Darling (August 21, 2008), Bernard Keane rather pointedly noted that the story of Cubbie Station is “an incestuous saga of arrogance & influence”! He further notes “The extent of the Queensland Government’s parochial and profligate attitude to water management continues to attract criticism. Put simply, the Queenslanders couldn’t care less about the health of rivers either on their side of the border or beyond. Penny Wong can only wring her hands and sympathise with farmers downstream. The Queenslanders continue to trot out the line that they take only 5% of water from the Murray-Darling. It’s literally correct — that’s what they take out. It’s what they prevent from entering from run-off that is the key — and that is much more. The CSIRO’s recent report on Water Availability in the Condamine-Balonne reveals a vast and unsustainably over-allocated system that sees over 50% of water extracted from the Balonne-Culgoa before it reaches NSW.” One doesn’t need to go into the Darling or down into the Murray to see the environmental havoc wreaked by this water “mismanagement”! Thousands of hectares of dead trees on the Culgoa floodplain and a system approaching tipping point! For years, Cubbie Group — the vast cancer on the Balonne-Culgoa which exemplifies all that is wrong with the states’ management of water — has maintained that it only extracts 0.2% of Murray-Darling water. Fair Water Use Australia has pointed out that this ignores the bulk of Cubbie’s water — from overland flows prevented from entering the Balonne and Culgoa Rivers — and that the 0.2% is based on average flows anyway, rather than conditions following heavy rains. On August 19 2009, the Sydney Morning Herald ran an article – in the Federal Politics section – titled “Cubbie Station sums up Murray-Darling tragedy”. It calls Cubbie Station a case study in (water) overallocation. The station has long been cast as the villain in the slow death of the Murray-Darling river system. At this time, the 93,000 hectare property was up for sale, and there was debate about the Commonwealth purchasing its water reserves, and is a reminder that the Murray-Darling story is an environmental and economic tragedy involving many villains. As the Federal Government is cautioning, buying these water entitlements is not a simple matter. This, in turn, reflects the failure of governments, irrigators and water authorities to establish nationally consistent rules for the Murray-Darling system. The first sticking point is that Queensland law on water entitlements is different from that of other states because the water cannot be sold separately from the land entitlements. Queensland is moving to enable separate sales, but faces a legal challenge from irrigators along the Condamine-Balonne river system, from which Cubbie draws its water. Clearly, though, uniform rules are essential if the Murray-Darling is to be managed properly. Despite Queensland’s government being responsible for the overallocation, Anna Bligh (the Premier at that time) was right in saying that the Cubbie sale offered an opportunity for the Queensland, NSW and federal governments to reconsider water allocations. As things stand, the main beneficiaries of a water release from Cubbie station would be farms across the border in NSW, whose licences permit them to pump more out of the river as levels rise. The Commonwealth might have to buy back Cubbie station’s entitlements and matching amounts from NSW irrigators to achieve an extra, and expensive, environmental flow. The lesson of Cubbie station is that there isn’t nearly as much water available as once expected, particularly if climate change has taken hold. Federal and state governments need to go back and review all licences and rewrite the rules of the current highly compromised national water plan to arrive at a system capable of sustaining the environment and agricultural ventures for years to come. In “The Land” (15 March 2013), Matthew Cranston wrote an article “Cubbie’s new owners look at water sale”. He noted “THE new Chinese and Japanese ­owners of Cubbie Station are looking at selling water back to the federal government less then two months after paying $232 million for the debt-laden cotton farm.The 96,000 hectare property in south-western Queensland has been the centre of controversy because of its huge water entitlements within the Murray Darling Basin system. It officially changed hands on January 15 after being bought by CS Agriculture, a company backed by Chinese group Shandong Ruyi, Japanese trading giant Itochu, and fifth generation Australian wool trader Lempriere Group…”We have committed to consider the option of selling any excess ­entitlements into water buy-back schemes,” Mr McKenna said at the Rural Press Club in Brisbane.”. To date, nothing appears to have happened, and if water buy-backs are being considered, there certainly doesn’t seem to be any rush to complete them…much to the detriment of the river system! My Great Grand Uncle, Captain George Rickinson Swan Pickhills, captained steamers up and down the Darling River from the second half of the 1800s up until the early 1900s. He was an unintentional environmentalist, and protector of the waterways, long before it was fashionable to be so! He was an outspoken man, and wrote many letters, and observations, to both state government river authorities and newspapers regarding many issues of water management, and infrastructure building, particularly aling the Darling. The seasonal ebbs and flows of the river are well noted in his observations, including periods where, for NATURAL reasons, the river was not navigable due to the drop in water levels. He would be horrified to learn of the actual sale of this precious commodity, in huge volumes, to properties that not only witheld the excess water from the tiver system, but were openly growing crops that consumed enormous quantities of same water! It is perhaps due to his agitation and outspokeness that it vould be of enormous benefit to have him around today! Do not take on rough, tough Yorkshire men! That aside, this issue of overallocation of water rights, and the inability to maintain them has been going on for a long, long time now. In a country where droughts are as prevalent as floods, one has to wonder just what the hell is going on! It raises a lot of issues, and one has to question just how much influence does money have! 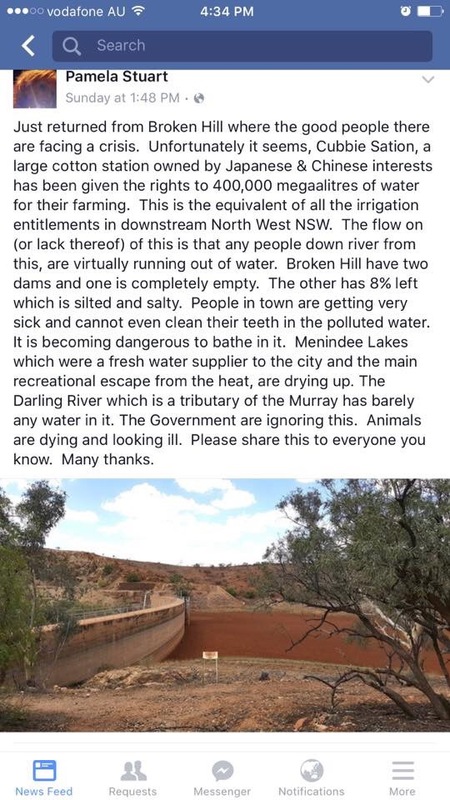 Considering the well documented historical records of the ebbs and flows of the Murray-Darling river system, one has to question the validity of EVER selling water rights from them in the first place! Considering that the property was bought in recent years by FOREIGN investors, who had to be granted permission by the government of the day for the purchase, why was not a huge cut-back on the size of the water allocation part of the deal! Of great concern has to be the question of, with the investors living in other countries, whether the environmental concerns regarding these important river systems are of any concern to them whatsoever! Considering that Cubbie Station KNOWS that it takes far, far more water than it needs in allocations, in times of duress (as far as water flow goes on the rivers), could they not voluntarily instigate negotiations with the government to either (a) sell back excess water or…and far less likely (b) voluntarily just return water to the system purely for the sake of the environment, and saving the river system! If nothing else, considering that Cubbie Station is seen, in the public eye, as a giant, grasping, greedy, self indulgent property, that has a total disregard for the environment…it would be a great PR exercise! The government really does need to step in, and not only massively cut back their water allocation, but look at the detrimental effects on the environment & waterways caused by Cubbie Station! But the problem is about more than water allocations! It is about unsustainable farming practises in general, growing crops along the river systems that require massive amounts of water to irrigate them. The government needs to promote and reeducate our farmers about adopting sustainable crops and farming methods…and not just there, but along all of our water systems as well! The effects of climate change are becoming more noticable as time goes on, and the next period of severe drought – if not happening already – is probably not far away! In a country of climatic extremes, we need more foresight, and a more insightful look at how we manages our very precious resources. Greed and ignorance are not the answers to these very complex questions! *Malcolm Turnbull was ousted from the position of Prime Minister by a spill within his own LNP in 2018. Subsequently, he has withdrawn from political life. The ABC program “Four Corners” did an expose on Murray Darling water allocation abuses in 2018, and the program should be available on the iView app. Gay History: Colin Carson & Frederick Drummond.